The second muttonbird island that Edgar Stead and companions stayed on was Solomon Island (Rerewhakaupoko), just north of Big South Cape Island (Taukihepa), off the south-west coast of Stewart Island. Stead landed on Solomon Island for a few hours the day after leaving Kundy Island in December 1929, discovering saddlebacks and bush wrens to be present, among other wildlife treasures. He resolved to return to make more detailed studies. 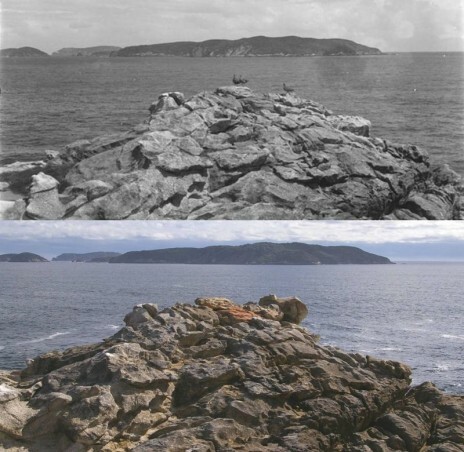 Putauhinu Island viewed from the southwest point of Solomon Island in 1931 (above, Edgar Stead photograph 2010.75.148, Canterbury Museum) and 2012 (below, photo by Colin Miskelly, Te Papa). The third skua in Stead’s photograph was standing on a rock slab that has since tipped over, changing the profile of the rock outcrop. 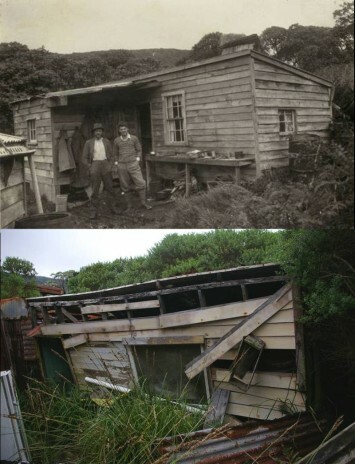 After making enquiries through John Morrison of Bluff, Stead was granted permission by William Leader to stay in his muttonbirding hut at Bats Cave landing on the south coast of Solomon Island. Stead and his companions Major Robert Wilson and Sir John Hanham arrived on the island on 10 November 1931; Stead & Wilson stayed until 14 December, with Hanham replaced by Eb Hay for the last 10 days. The main bird species studied by Stead and his companions on Solomon Island were South Island saddleback, bush wren (which Stead described as a new subspecies in 1936), Stewart Island robin and Stewart Island fernbird. All these species were extirpated by ship rats that invaded Solomon, Big South Cape and Pukeweka Islands in 1964. 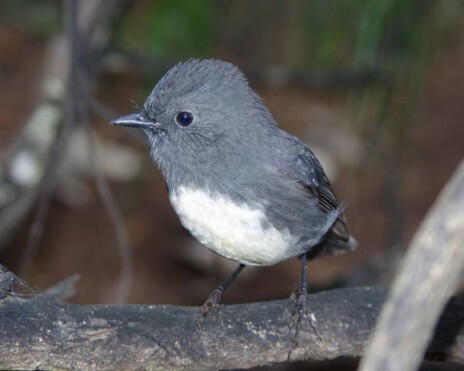 The robin and fernbird survived on other muttonbird islands (as well as at a few places on Stewart Island itself). Wildlife Service personnel succeeded in rescuing South Island saddlebacks by translocating them from Big South Cape Island to other rat-free islands. An attempt to rescue the bush wren failed, and it is now extinct. 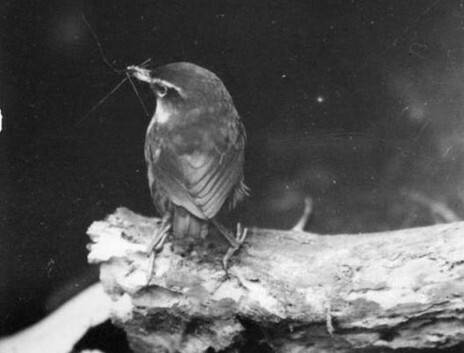 From 1964 to 2006, Solomon Island was an avian desert, with voracious ship rats preventing successful breeding or recolonisation by many bird species. The rats were eradicated in 2006, leading to a remarkable recovery in bird life. Tui, bellbirds, tomtits and yellow-crowned parakeets are now abundant there. Robins recolonised within a year of rat eradication, and are now as abundant and tame as in Stead’s time. South Island saddlebacks were reintroduced to Solomon Island on 20 March 2012 in a joint Rakiura Titi Committee / Department of Conservation translocation, when 8 birds were moved from Pohowaitai Island. Stead’s 1931 saddleback studies were focussed on confirming that the brown-plumaged ‘jackbird’ was the juvenile plumage of the strikingly-patterned South Island saddleback. In contrast, the otherwise similar North Island saddleback does not have a distinct juvenile plumage, a fact that Stead confirmed on a visit to Hen Island (Taranga) 2 years later. My visit to Rerewhakaupoko in March 2012 was supported by the Rakiura Titi Committee, the Heaslip whanau and the Austin whanau, and I was generously hosted by the Heaslips. It was a great privilege to see adult saddlebacks and jackbirds back on Solomon Island 80 years after Stead had seen the same, and to share this magical experience with my hosts. One of the other bird species that Stead encountered on Solomon Island was the broad-billed prion (parara). 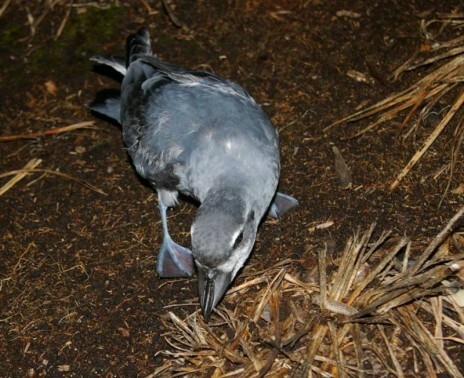 This species suffered enormous mortality in a severe storm in July 2011, with hundreds of thousands of birds killed. Numbers were much reduced on Solomon Island in 2012 compared to previous years, according to my hosts. I saw seven parara, and was able to collect feather samples from five birds to allow genetic comparisons with birds washed up on North Island beaches, and held by Te Papa.